The increasingly inaccurately named series on yeast terminology continues with a post diving into how, exactly, hops prevent bacteria from infecting beer. I realize now I should have called it "the microbiology of beer," but too late. Anyway, in essence, bacteria can't handle alpha acid, and the IBU scale measures the amount of alpha acid in the beer, so higher IBU = more bacterial resistance. It's the details of how this happens that is interesting, however. As we all know, hops contain alpha acid. Alpha acid, however, is not a chemical compound. It's a class of chemicals. The most important alpha acid is humulone, but there are several others, like adhumulone, cohumulone, etc. Now, alpha acids are not what we want in brewing, because they dissolve poorly in beer. Imagine dripping olive oil onto water. The olive oil just floats on top in globs, and doesn't mix with the water. That's not going to prevent bacteria very effectively, because the alpha acids are not going to get into very much contact with the bacteria. Also, alpha acid is not very bitter. If the above makes you suspect that you don't have to actually boil the wort to cause isomerization that's entirely correct. However, more heat, and more time, causes more of the alpha acids to be isomerized. A typical one-hour boil causes only about 30% of the alpha acid to be isomerized, so the yield is actually pretty low. Iso-alpha acids dissolve much better into the beer, and this brings them much more into contact with the bacteria, which is what we want. They are also much more bitter. As we saw in the previous post, bacteria are divided into gram-positive and gram-negative bacteria. The gram-negative bacteria have a different structure to their cell wall, and this enables them to keep the alpha acids out. So alpha acid is not effective against gram-negative bacteria. What happens to the gram-positive bacteria is interesting. The precise biochemical details are quite involved, but basically, bacteria use something called the "proton motive force" to pull nutrients into their cells. This is driven by a difference in electrical charge and a difference in pH between the inside of the bacterial cell and the surroundings. So the bacteria use the combination of these two forces to pull nutrients into the cell. 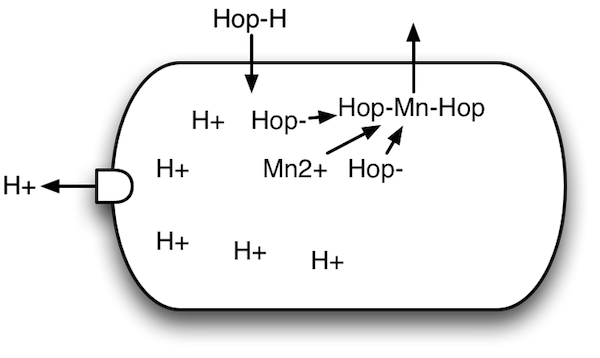 Alpha acid interferes with this arrangement by creeping into the bacterial cells (the Hop-H in the diagram). 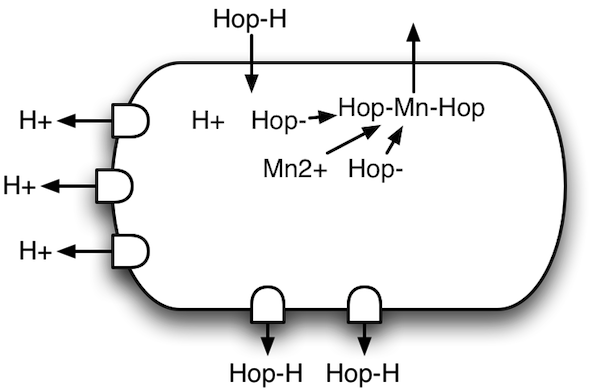 The higher pH inside the cell causes the alpha acid to break up into smaller molecules (splits into Hop- and H+). Two of these smaller pieces (Hop-) capture free ions (electrically charged molecules (Mn2+)) inside the bacteria, then float back out (Hop-Mn-Hop). But they leave protons (H+) inside the cell. One of the things that powers the proton motive force is that the bacteria concentrate protons on the outside of the cell. This is what the little "gate" on the left-hand side does: it pumps protons out of the cell, helping form the "transmembrane proton gradient" that's part of the proton motive force. However, the hop compounds leave too many free protons on the inside, and that causes this arrangement to fall apart. That is, the proton motive force is weakened. The result is that the bacteria find it harder to use the force to absorb nutrients. That is, they find it hard to eat. So hops don't actually kill bacteria. They just starve them, which in effect means they prevent the bacteria from gathering enough nutrients to split in two and create more bacteria. Now, the strange thing here is that the bacteria that spoil beer (or which are used to add sourness to beer) tend mostly to be gram-positive bacteria. But those are the ones that can't tolerate hops, so what is going on? It turns out that among the lactic acid bacteria some have developed hop resistance. Hop resistance turns out to work in two main ways. One is that the mechanisms for ejecting the hydrogen ions (left side) are beefed up considerably. 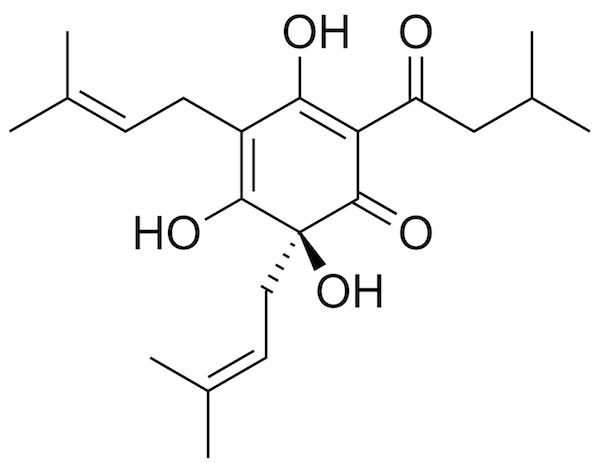 The other is that they have developed a mechanism for ejecting hop compounds (bottom side). In combination, these two effectively clean up the cell, preserving the force that the bacteria use to pull in nutrients. Note that of the lactic acid bacteria only a few species have developed hop resistance, and even within these species not all strains have it. The exception appears to be Lactobacillus lindneri, since every strain of this species tested so far is hop resistant. Interestingly, the proton motive force is common to all life, and is a key part of how life works. It's thought that the reason bacteria and archaea have never been able to evolve into multi-cellular life forms is that they lack mitochondria. Mitochondria have hugely powerful proton gradients, actually equivalent to a bolt of lightning if you account for the short distances involved, and so they have special genes to control the gradient so that they don't electrocute themselves. Eukaryotes make use of these genes, which allows their cells to become bigger and more complex without losing control of the gradient. It's been theorized (but not proven) that the lack of these genes is what prevent bacteria and archaea from developing more complex life forms. I have most of this from the paper Beer spoilage bacteria and hop resistance, Sakamoto and Konings, International Journal of Food Microbiology 89 (2003) 105–124. If you want more detail you can find it there, but note that it's not an easy read. Many thanks to professor Per Bruheim for answering my questions about this. The last paragraph is based on Why Are Cells Powered by Proton Gradients?, Nick Lane, Nature Education 3(9):18. The scientific literature appears to be unanimous in claiming that normal alpha acid has no antibacterial effect because it doesn't dissolve in water. For example, the paper above says alpha acid is poorly soluble in water and "not transferred as such to beer." The Oxford Companion to Beer says alpha acid is not soluble at all. Per Buer did a small experiment with three bottles of wort where he added lactic acid bacteria. All at pH 5.5 and OG 1025. He then added 0.75 grams of Amarillo hops (unboiled!) to one bottle. After 20 hours at 24C pH of the unhopped bottles was 3.5 while the dry-hopped bottle was 5.0. Later he added hops to the third bottle, and this slowed the pH drop in that bottle, too. So what does this mean? I don't know. It's certainly confusing. I hope to be able to clear this up eventually. This is the test I did. Has anyone done tests with any of the other traditional brewing herbs reputed to help prevent infection? @Dave: Yes, a Norwegian professor has done a test on juniper infusion. I'm waiting for him to finish the paper. Also, I found a paper on Achillea millefolium, but haven't had time to read it yet. Mr. Marius,could you provide the article about the Achillea millefolium? The reference is: Antibacterial Activity of Water and Alcoholic Crude Extract of Flower Achillea millefolium, Rasha N. Hasson, Raf. J. Sci., Vol. 22, No.3 pp 11- 20, 2011. Thank you very much, from this text I got another basis for my hypothesis. In the near future I would like to share it with you.